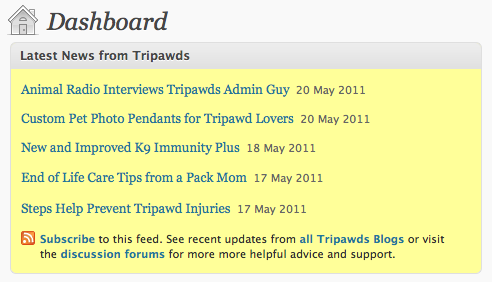 Tripawds bloggers may have wondered where their dashboard notice announcing the most recent Tripawds News blog post went a few weeks ago. If not, they’re certain to notice the new announcement listing the five most recent posts from all the Tripawds Featured Blogs. With the WordPress 3.1.2 update, the “Dashboard Feed” option mysteriously disappeared, leaving site administrators no way to show recent posts in the dashboard of all blogs across the network. It left me wondering what the heck happened! I posted in the WordPress forums about our Missing Recent Posts Feed in User Dashboard, asking if anyone else noticed or had an answer as to why it was gone. Silence. About a week later, one member finally confirmed the issue and came up with a fix. The solution, however, required hacking the functions.php file which would not work for this community since Tripawds members can choose from more than 130 blog themes. 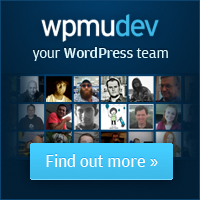 Thanks to our Supporter plugin from WPMU Dev, Tripawds Supporters have access to even more premium themes. Piet from WordPress Tips quickly developed this plugin to show the latest posts from the main site of a multisite install in the user dashboard of all sub-sites across the network. By default the widget displays the three most recent posts from the main site. While no configuration is required for those happy with these settings, the plugin can easily be modified. Edit msrss.php to change the number of posts displayed (Default: 3). See installation instructions for complete details. We took things a step further by adding the extra information and links shown below the recent posts, as shown in our screenshot above. We also created a created a custom feed for multiple blogs to use in the widget. Tripawds uses the Recent Global Posts Feed plugin from WPMU Dev to generate our feed for recent posts from all member blogs. This convenient plugin includes a Recent Global Posts Feed Widget for showing our global posts feed as a sidebar widget. Download the Recent Global Posts Feed plugin. Upload the file to wp-content/ and check your new feed. It’s that simple. All thanks to our WPMU Dev Premium subscription! 😎 Cool. But members don’t need to have a blog to see this feed. Just visit your User Dashboard to check it out! HMMMM……so much technology, but there still isn’t a was for active members to leave a blog post without waiting for someone to get around to approving it…….I’ve made my last attempt….actually now I have! Sure there is! It just depends on the Discussion settings for each blog. The default is for first comments by anyone to require moderation. Since this this is your first comment on this blog, it required approval. Now, your future posts will not, on this blog at least. Very nice article Jim and you made a great customization too! Thank you! It’s always awesome to see someone roll up their sleeves and put together the solution they need for their site. Well done, sir.